1) What did you do in 2009 that you'd never done before? I went on a Peace trip (there were a lot of firsts included in that), got the freaking swine flu, had my writing published, saw the Jonas Brothers in concert, and went dog-sledding in Alaska. 2) Did you keep your New Year's resolutions, and will you make more for next year? I'm not really making any resolutions for next year. Generally speaking, I strive to live a life that reflects the character of Jesus to people, contribute to the lives of others in a positive and meaningful way, be a productive person and constant learner, always have a grateful heart, and continually cultivate my interests. 6) What would you like to have in 2010 that you lacked in 2009? I'd love to have a few stamps in my new passport and an "in" to Club 33. 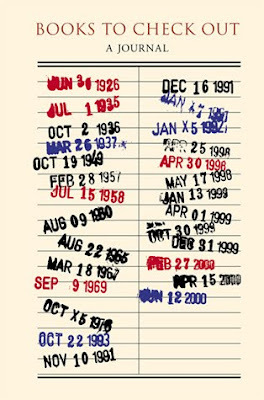 7) What date(s) from 2009 will remain etched upon your memory, and why? August 1--when I came home from the Dominican Republic. It was great to see my family and go to In-N-Out. Not sure. I learned a lot! God really bothered me this year (in a good way). I was stretched physically, spiritually, and emotionally. However, none of those things are "achievements"; it's only because of God that I know him better, not because of anything I did or achieved. 9) Did you suffer illness or injury? Other than getting kicked in the face by the swine last month, no. 10) What was the best thing you bought? A subscription to Netflix, for sure. 11) Whose behavior merited celebration? 12) Whose behavior made you appalled and depressed? 13) Where did most of your money go? 14) What did you get really, really, really excited about? What don't I get really, really, really excited about?! 15) What song will always remind you of 2009? I Gotta Feeling by the Black Eyed Peas. Wiser? Definitely. Healthier? In some ways. Richer? In many ways. 17) What do you wish you'd done more of? Read, studied, and traveled. I don't think I'll ever do any of those things enough for my liking, though. 18) What do you wish you'd done less of? 19) How did you spend Christmas? Church, Claim Jumper, and gifts with my family on Christmas Eve. Hanging around the house feeling lousy on Christmas Day. And on Christmas Night, I saw Sherlock Holmes with my big brother. 20) Did you fall in love in 2009? Unless the lovely young men of Gossip Girl count, no. 21) What was your favorite TV program? LOST, Gossip Girl, Grey's Anatomy, Veronica Mars, and the Soup. 22) Do you hate anyone now that you didn't hate this time last year? 23) What was the best book you read? Oh, Jane Eyre, hands down. I can't believe I hadn't read it sooner. One of the greatest books ever. 24) What was your greatest musical discovery? I totally loved Lady Gaga's CD this year. Sue me. 25) What did you want and get? 26) What did you want and not get? 27) What was your favorite film of this year? The Road. Bright Star. Sherlock Holmes. Harry Potter. Julie and Julia. The Young Victoria. Up. 28) What did you do on your birthday, and how old were you? I turned 27 and did a lot of celebrating with cherished friends. 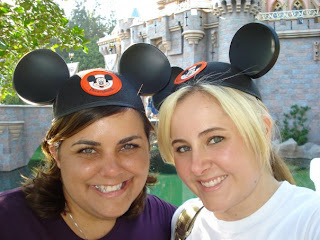 On my actual birthday I went to Disneyland and had a fancy lunch at the Blue Bayou with my mom...yum! 29) Which celebrity/public figure did you like the most? Joel McHale. The man just makes me laugh. 30) How would you describe your personal fashion concept in 2009? I wear what I feel like wearing. 31) What kept you sane? My family, friends, co-workers, and God. 32) Who did you miss? I miss my faraway friends so, so much. 33) Tell us a valuable life lesson you learned in 2009. Trusting God: 1. Tough. 2. Not optional. 34) What did you gain this year? 35) What did you lose this year? 36) Who was the best new person you met? A lovely Southern belle named Chelsea Collins. "Yay-ay-ay-ay, it's a party in the U.S.A."
You've probably seen a little version of this Italian Baroque masterpiece on the top right corners of many an envelope this year. Every Christmas, the U.S. Postal Service releases fun collections of holiday stamps. They also issue a “traditional” holiday stamp that features the Madonna and Child, which has been an annual practice since 1978. This year, the traditional stamp featured this painting by Sassoferrato. Mary tenderly cradles the Christ child in her arms, holding him with elegance and grace, softly resting her cheek on the top of his head while two sweet cherubs look down upon them with devotion. It’s a simple composition—there is no backround, only a few clouds that create a timeless, eternal setting. The Madonna and Child are not enthroned in a regal church or earthly landscape setting, not bogged down by big halos or golden crowns, not clothed in jewel-encrusted and fur-trimmed robes. It’s the mystical, luminous, divine aura that shows us this is not a normal maternal scene. 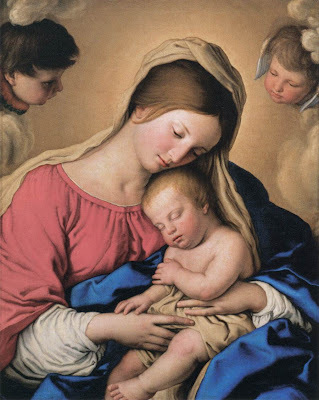 It is the serenity in Mary’s face, the peaceful sleep of the Christ child, and the mystical sense that he is not an ordinary baby that creates a captivating atmosphere; Mary knows that her son was not just given to her, but to all of humanity. The divine light that bathes the figures in this painting is such a beautiful illustration of the hope that the birth of Christ illuminates the world with on Christmas. What exactly IS a Christmas movie? So…question. What makes a film a “Christmas movie”? Is it a movie that contains a narrative specifically about Christmas things, like Miracle on 34th Street, A Christmas Story, or National Lampoon’s Christmas Vacation? Is it a movie with a Christmasy title that doesn’t really have anything to do with Christmas, but just happens to take place in December? I mean, how much of White Christmas is really about Christmas? I’d say that movie is probably 20% Christmasy. And The Holiday could have been virtually the same movie if it took place in the summer. Speaking of romantic comedies, have you noticed that many of them take place around Christmas, like Love Actually and the Bridget Jones movies? Some might consider these Christmas movies, but they would be the same stories in any other season. What about movies that are released on or around Christmas and are just associated with the season of Christmas, like The Curious Case of Benjamin Button? Are we going to consider Sherlock Holmes a Christmas movie? I consider Harry Potter and the Sorcerer’s Stone a Christmas movie, but really…it’s not. Are movies that have just a few scenes at Christmastime considered Christmas movies, like When Harry Met Sally, Little Women, or Meet Me in St. Louis? “Have Yourself a Merry Little Christmas” was written for that movie, but it’s not really a Christmas movie, is it? There is nothing fundamentally Christmasy about these stories, is there? Would you consider them Christmas movies? What about Heidi? It’s often on Christmas movie lists because the famous ending is at Christmas, but it’s not a Christmas movie. And speaking of alpine adventures, why is that song about raindrops on roses from The Sound of Music played as a Christmas song every year? For you dudes who think Die Hard and Gremlins are Christmas movies...I mean, really? Enlighten me...what is a Christmas movie? And what’s your favorite Christmas movie? 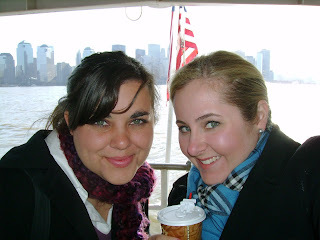 New York, heading to Liberty Island; 2007. The Getty Center, Los Angeles; 2009. Dress-up time in Alaska, 2009. Heading to Westminster Abbey. London, summer 2008. Skagway, Alaska and Canadian border; summer 2009. Heading to Trafalgar Square. London, summer 2008. My sweet friend Riley has a fun "Spotlight" featured on her blog every so often, where she posts about "something I love or a friend or something great." So I wanted to do a spotlight feature of sorts on my friend Hayley. A fellow Anteater (ZOT! ZOT! 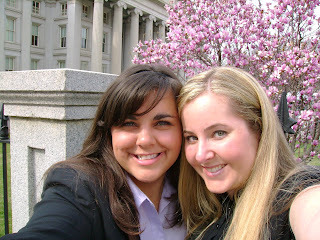 ), I met her through a friend during our undergrad years at UCI and for a while she was only "Amy's friend, Hayley." But Hayley has become a cherished friend over the years and we've had many adventures together. We love museums, ancient history, reading books and having opinions about them, and drinking coffee together. Her house, my house, church; over dinner, lunch, Golden Spoon or Starbucks; wherever it is, great conversation is effortless. Sometimes it's about jobs or boys, family or friends, the meaning of life, what happened last night, breaking a nail or breaking up. Sometimes it's at noon, sometimes at midnight, by e-mail or phone or face to face....it's always heart to heart. According to an Associated Press study, one in four adults read ZERO books last year. We are not exactly devouring literature! So if you've been feeling bad about not reading (or finishing) that book that's been sitting on your nightstand for who-knows-how-long, take comfort in knowing you're not alone. Or don't. Reading helps you write better, improves your vocabulary, stimulates the imagination, and generally makes you a more knowledgeable, cultured, and well-rounded person. Half of the world is illiterate, and if you don't read, you might as well be, too. I know many of us will make resolutions to read more next year. Let's commit to turning off the TV once in a while (gasp!) and start a new reading regime (‘Readgime’? Anyone?). I'm excited to start my 2010 reading list on this blog (and in my fun new journal, seen above...cute, right?). I will leave you with a crazy fact…if you work 40 hours a week and sleep 8 hours a night, you have 72 hours of free time each week. May that encourage your reading endeavors in 2010! This is one of my favorite poems, called “Death Be Not Proud.” It was written by John Donne, one of Britain's most famous priests and poets. Now, I love poetry, but I don’t want to pretend like I understand it all the time, especially Donne. But I think this poem, after you read it a few times, reveals a lot of God’s truth. Have you ever thought about what will happen to you when you die? Many of us do see death as an enemy, as something to fear, something that threatens us, something “mighty and dreadfull.” But God did not intend for us to die. Wow…when was the last time you thought about the gift of everlasting life? When was the last time you were excited about it? I won’t ever be able to completely comprehend what everlasting life means! But as we celebrate Christmas this month, this poem reminds me of one of the many reasons I can celebrate! We can face death with peace, knowing that through it, God will bring to himself those who believe in him...Paul knew this when he wrote, “...to live is Christ and to die is gain.” (Philippians 1:21) That’s definitely reason to rejoice! My friend and co-worker, Nicole, treated me to afternoon tea at the Ritz Carlton in Laguna Niguel today for my birthday. One of my very favorite things in the whole world is having afternoon tea at fancy hotels, and this was the third time I've been able to par-teake. Here's our delicious tea service...tea sandwiches (bottom plate) included salmon with mascarpone cheese and caviar (yep, I tried caviar--not bad! ), English cucumber with dill cream; cherry tomato; and radish, egg salad with roasted red pepper mousse on toasted white bread, and balsamic portobello mushroom with goat cheese on a focaccia crouton. The strawberries were stuffed with blue cheese mousse and sprinkled with pistachio dust. Pistachio dust...I know, it's ridiculous. Here's my tea. I forgot the name but it was rose-flavored. It tasted like...well, it tasted like I was drinking the prettiest, softest pink roses I could ever imagine. Nicole got a spicy chai from India. The servers were constantly pouring our tea for us, using the strainers each time. The pots of tea were kept warm from the tea lights placed underneath them...is that where the name for those little candles came from? I tried really hard to stick my pinky out and pose properly, but the cup was full (and heavy!) and I nearly spilled when this picture was taken. To ensure a clean dress, I had to take a quick, unladylike gulp! Another delicious drink, besides our teas, were these yummy alcohol-free Mimosas, or as I like to call them, Mi-faux-sas, made with Sprite and a delicious passion fruit syrup. Very tasty. And you bet I felt pretty hoity-toity drinking from a champagne flute! After the sandwiches, we enjoyed scones with cream, lemon curd, and wild berry compote, and then dug into the desserts--cranberry pistachio florentines, gingerbread cookies, kirsch cream puffs, orange chocolate cups, lemon raspberry cheesecakes, and spiced chocolate macaroons. And yes, we ate it all...so what? The hotel was decorated beautifully with lots of fresh flowers and Christmas decorations. The flower arrangements in the lobby reminded me of Jeff Leatham's designs. (Watch his show, Flowers Uncut, on TLC. So good. The man is an artist.) It was a gray, rainy day but our ocean view was still incredible. I felt like we were in another country on a fancy holiday and very far away from Orange County. This is a huge sandcastle display in the hotel made out of food! Little kids were fascinated. And by "little kids," I mean...me. Nicole and I pretend to fight all the time. We're constantly poking fun at each other and pushing each other's buttons. There might even be some physical fighting in the office once in a while. On the surface, we are completely different...Nicole hates Disney pop music, "accidentally" broke someone's nose during a karate tournament (ha...just kidding. It was an accident. I think. ), and hates wearing dresses. She's got an urban, tough girl coolness about her. I, on the other hand, love the color pink, watch the Disney Channel, and say "ohmigosh!" But we are more alike than it may seem--we love traveling the world, discovering art in unexpected places, loving on college students, and learning about God. We've seen each other make stupid mistakes, encouraged each other through tough times, eaten many bowls of tomato soup at Cinnamon Productions together, and celebrated with each other in victories. I am so blessed to be able to work with one of my best friends. Thanks, Nicole, for a very memorable birthday treat! I was simultaneously excited and panicked when I saw a picture of one of my favorite places in Orange County featured in C Magazine this month. The place is a courtyard in Costa Mesa, tucked behind some tall office buildings and a parking structure. It’s called the Noguchi Gardens. Yes, you read that right. A courtyard called the Noguchi Gardens. It’s really a space of art and sculpture, created by the Asian American artist Isamu Noguchi, in an attempt to interpret the different elements of California. The work of art itself is called California Scenario. What I love about this place is that it’s completely other-worldly. Right off the 405, across the street from a busy shopping center, is a serene, quiet, peaceful place to escape the noise of the cars, the crowds of people, and the cares of the day. It’s a place that's restful but alive with movement and energy. 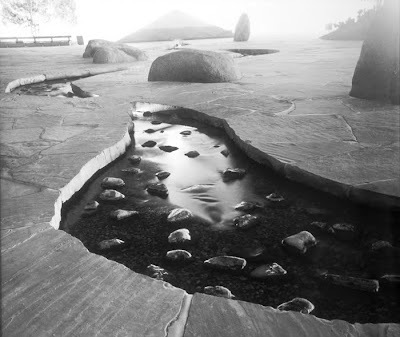 A small stream of water trickles from a huge triangular sandstone waterfall and snakes through the middle of the courtyard to a slanted granite pyramid. A circular mound of desert cacti and plants represents the beauty of California’s deserts and contrasts with a square patch of meadowland surrounded by redwood trees. Lights surrounding the perimeter of the space give it a welcoming glow much like a warm fireplace on a chilly night. And the Gardens provide a different visual experience with every visit because of the way natural light creates different shadows with the elements that make up the space. The sound of the water, constantly moving shadows, and variety of textures and plants create a lively space that is more of a garden than a courtyard. I have many fun memories associated with this place…my friends and I have bundled up on cold nights and watched the stars from the middle of the Gardens, laying flat on our backs. We’ve brought lanterns and cookies and recited famous poems and sonnets (oh yes, with accents), children’s fables and limericks, and one of our favorites, Jabberwocky. We’ve grabbed frozen yogurt from America’s Cup on hot summer nights and sat on the slabs of sandstone that were still warm from the day’s sunshine, as we tried eating our yogurt faster than it was melting. We’ve played card games, hide and seek, and Catchphrase. And we’ve had plenty of impromptu photo shoots and heart-to-hearts. It's a magical place, and not-so-secret anymore. Are you ready to go to the Gardens? This ring is one of the most cherished things I own. It's a Claddagh ring that my dad bought for me in Limerick when our family took a trip to Ireland in 2000. It cost seven euro. Claddagh rings are traditional Irish wedding rings, but these days most people wear them to show their Irish pride. Whenever I see people wearing them, I always ask if they're Irish. And they almost always say yes and we chat for a minute or two about our Irish heritage. Except one college student. When I asked her if she's Irish, she said, "What? Oh, my ring? It's the same one that Buffy the Vampire Slayer always wore. I'm a huge fan." I didn't see that coming...but I thought it was pretty funny. 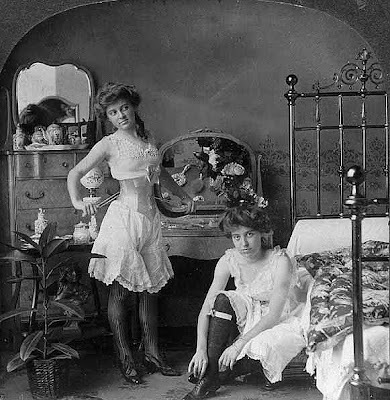 I don't understand how a woman can leave the house without fixing herself up a little - if only out of politeness. And then, you never know, maybe that's the day she has a date with destiny. And it's best to be pretty for destiny. Thanks to my friends at The O.C. Gazette, I had the pleasure of moonlighting as a semi-real journalist last month when I interviewed Hal Landon Jr. for an article in the December issue of the magazine. Mr. Landon stars as Scrooge in the South Coast Repertory’s annual production of A Christmas Carol. This was a special assignment for me, since I’ve seen the play nearly every year for a decade! Mr. Landon plays a perfect Scrooge, and he's such a sweet and humble man. A night or two after the interview, I saw him on My Name is Earl as I was flipping through the channels. “That’s my friend, Hal!” I thought to myself. Ha. And…go see this show! This will be Mr. Landon’s thirtieth year playing Scrooge!! I’ve been thinking about a specific leader in my life that I greatly admire, and then thinking about why I admire him. What makes a great leader? Teachable hearts. Here’s the thing—you can be well-educated, well-traveled, well-read, and have tons of ministry and life experience, but if you don't have a humble heart and act like you know everything and think you’re smarter than everyone, I don't really care to be under your leadership. Good leaders seek to find what God is teaching them in every situation—be it one of adversity or celebration—and invite people into their lives to continually challenge them and to learn from. That approach to life is actually something that I’ve noticed in all of the wisest people I know. Availability. Boundaries are important, of course, but a good leader is not someone who’s known for being too busy for people. Don’t ever hesitate to abandon a task to sit down and connect with someone. What good is leadership if you’re unavailable to lead? How useless is wisdom and encouragement if you don’t make the time to communicate it? Why would someone allow you to lead them if you don’t show them that you care? Reliance on God. I do not have to question a responsible leader’s judgment because I know he or she has sought God’s wisdom and waited for confirmation before making a decision. We need to have trust and confidence in a leader's ability to make good decisions without any sort of agenda. Actively listening. Don’t jump to conclusions. Don’t make assumptions. Just listen first. Being a great listener is one of the most profound ways to lead…isn’t that weird when you think about it? Sitting down and shutting up is the first step to being invited into someone’s life to lead. And it’s not just the words that we should listen to. What are people’s eyes and hearts communicating? Fun. Fun helps produce creativity and joy. It reminds us not to take ourselves too seriously. It energizes, refreshes, improves morale, excites, and lifts spirits. Fun is important; it shouldn’t be minimized to a trivial luxury. I'm thankful for the people in my life that are examples of godly leadership. What are some qualities that you value in a leader?